Nothing makes this unit scream old and dated then the dingy ceiling tile, fluorescent lights and carpet. While this combination is a staple in most professional buildings (and some older homes)—the good news is that a modern update is completely feasible. At Project Whimsy, the ceiling is a tell-tale sign of the aging building. There is a ton of wear and tear evident by damaged tiles and discolouration. Even the once white ceiling grid has turned an awful graying yellow colour. I knew this ceiling had to go from day one. What I didn’t know was there was no need to completely rip it down and start from scratch to improve the aesthetic of this ceiling. There are some pretty neat options and upgrades on the market when it comes to suspended ceilings. 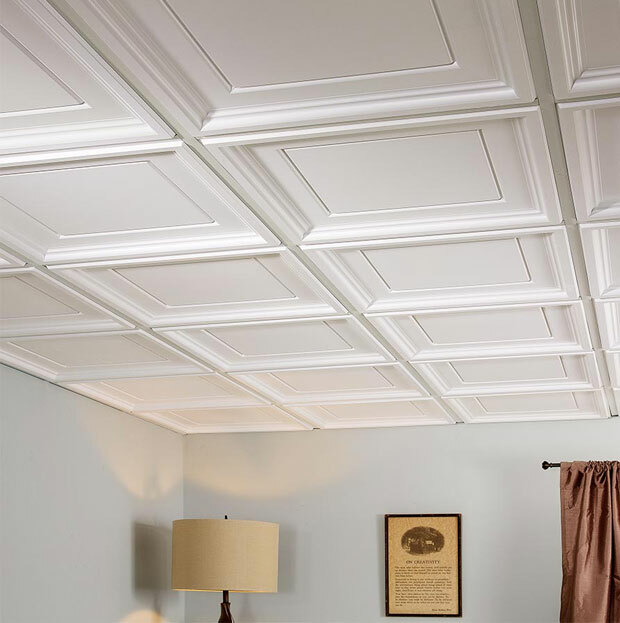 After a ton of research, I discovered a really great product by Genesis Waterproof Ceiling Panels, a PVC ceiling tile that can fit into any existing ceiling track. It nailed everything I was looking for—something durable yet stylish. I decided to reach out to them for some help with Project Whimsy and I’m excited to announce they agreed to partner with me for this project! To avoid a super long post, I’ll be dividing this into two parts. I’ll highlight some of the many benefits that attracted me to this PVC product. Next week, it’s all about my installation! 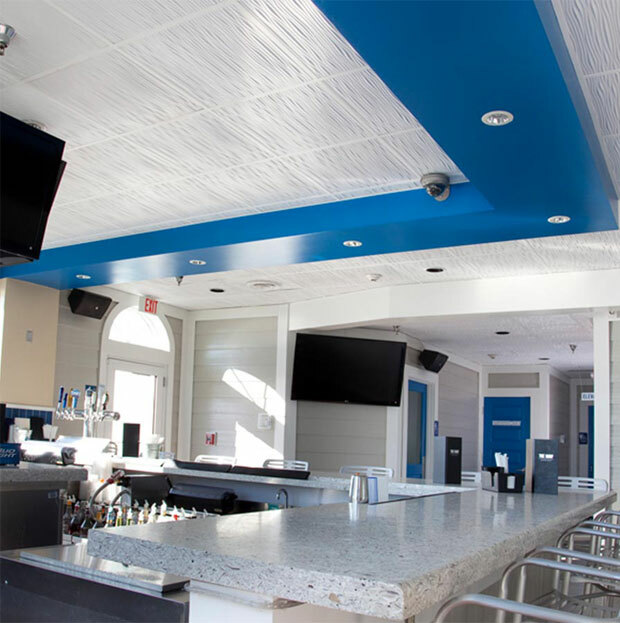 The first thing to catch my attention about Genesis Ceiling Panels is the fact that they are virtually maintenance free. They are not fiber-based like my current ceiling tiles. I don’t have to worry about it being a breeding ground for mold, mildew, germs, and bacteria. 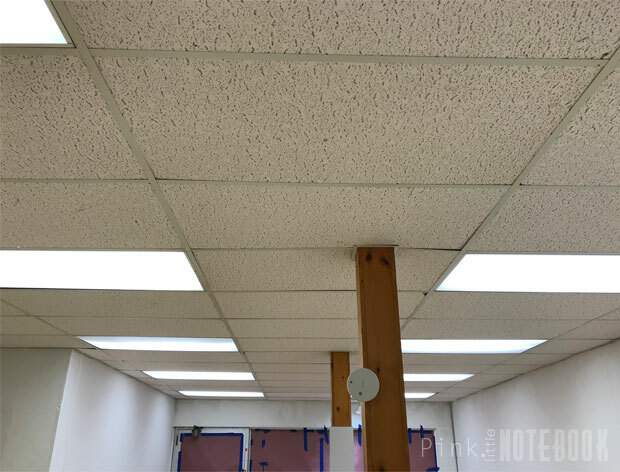 Current ceiling tile are a breeding ground for mold, mildew, germ and bacteria. They are 100% waterproof, which means no staining, swelling or rotting. I do have units above me, so it’s a nice reassurance that if a water leak does occur, I don’t have the added stress of ceiling damage. Also no yellowing over time is another huge plus, thanks to the UV resistance in Genesis Ceiling Panels . It’s usually that yellow tinge that makes things look old in a space. Sunlight and fluorescent lighting are usually the culprit of this. This product can be installed in an existing drop ceiling grid system, either 2′ x 2′ or 2′ x 4′ panels. It makes for an easy DIY project. All you need is a utility knife for straight cuts and a hole saw to drill holes if you have recessed lighting or sprinklers. The warranty is 25 years. A sign that a Company truly stands behind their product. They are also Class A Fire Rated and are approved for use in food processing facilities. They have six different collections to choose from, such as the Standard Series with simple, clean finishes, to The Designer Series showcasing more pattern and interest. Did you know, you can also transform your T-bar grid as well? The GridMAX Grid Covers help disguise those discoloured bars and give you a perfect match to the ceiling tiles. It’s the low cost-alternative to replacing or painting a metal grid. If you been watching my Instagram stories, you already know what ceiling tiles I have picked. And let me tell you, it’s already made such a huge improvement. Stay tuned for next week when I share my tutorial and my newly installed ceiling! 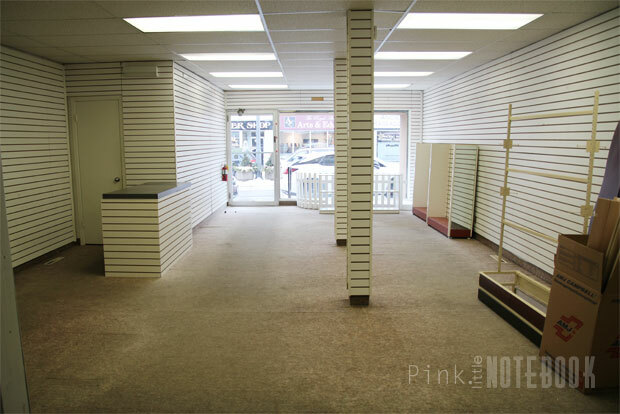 So many options are update the space. Outdated it right! This is amazing! I love the new PVC update. That is so cool and it looks so great and updated. This is so cool! 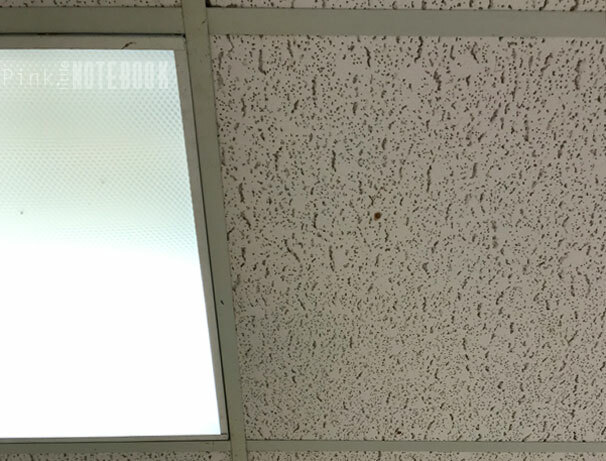 I had no idea that this type of ceiling tile/installation was available. What a great idea. Thanks for the tutorial.